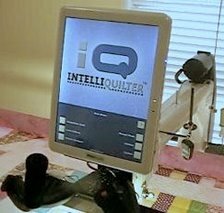 IntelliQuilter Training Videos: Using Line Pattern for custom quilting. Using Line Pattern for custom quilting. In this video I (Helen) am working on a Milky Way quilt. I wanted to custom quilt it so decided to create and use a line pattern to make the custom quilting as simple as possible. Instead of stitching individual motifs in each pinwheel/star with many starts and stops, the line pattern stitches continuously making just one start and stop per row. I decided I needed to add stitch in the ditch, which I did manually. I talk a little about how I created the pattern I use, show how to restart after a thread break and how I compensated for fabric draw up.